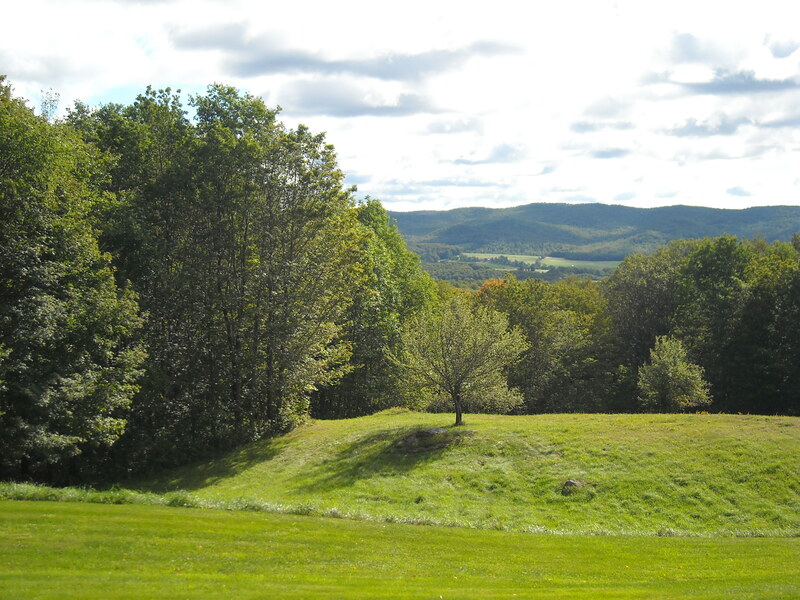 Our property on Hyland Hill consists of ten acres: five of open land, five of forest. The open land covers most of the high end of our plot, an acre of lawn surrounding the house and four acres of meadow rolling downward to the woods. A trust owns the large expanse of land to the south. Our wooded terrain declines further to the east and abuts another neighbor’s forty- or fifty-acre plot. 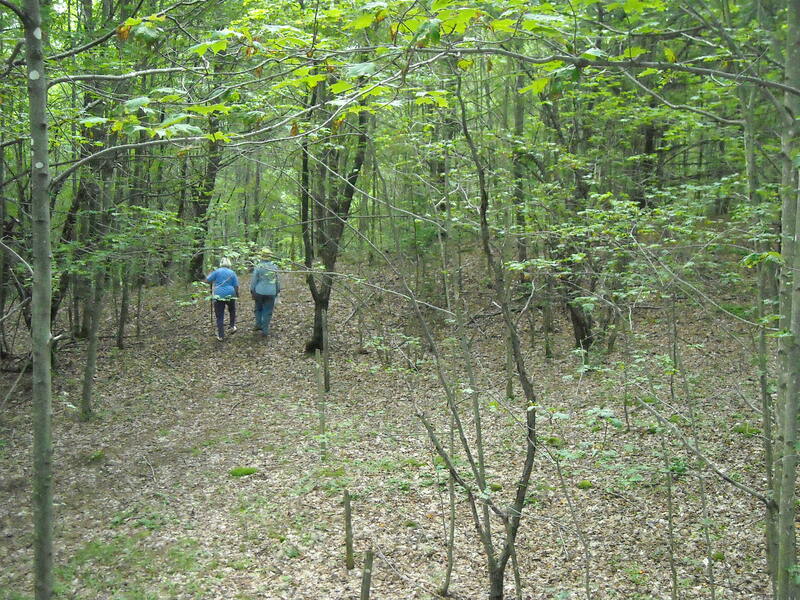 Paul and Doris, the previous owners, had cleared brush and trees in the forest to create what they called hiking paths; there’s a little stream along the northern edge; and the trees are dense enough that when we walk in among them, we quickly lose a sense of scale and imagine the forest to be large. In reality, what we own is a small property by local standards. But with our neighbors’ land unfenced and undeveloped, and with coyote, fox, deer, and moose footprints crisscrossing the snow all winter, the woods that surround us somehow feels expansive and wild. Over the years we have ventured deeper and deeper into the woods to explore. 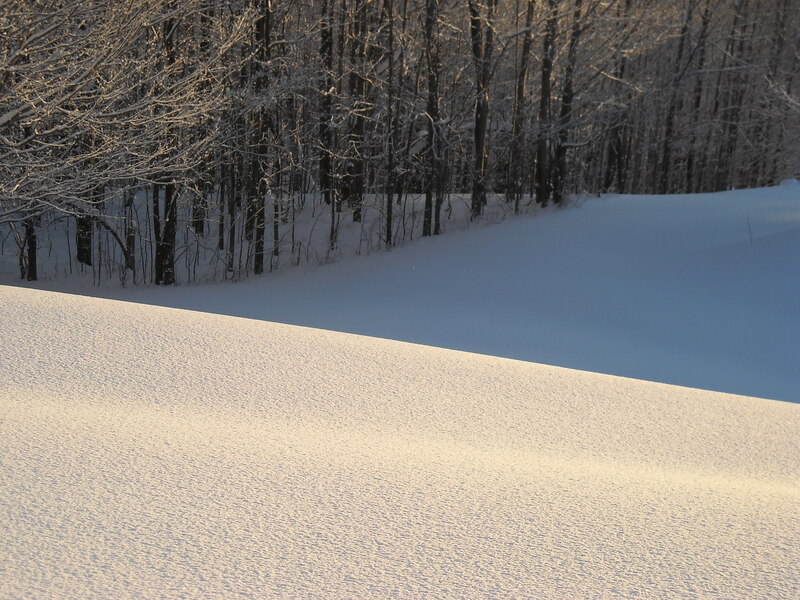 One winter we set off in six-degree weather, the snowpack a crusty ten inches deep at the time. Edith chose to use snowshoes; I preferred to wear my ordinary knee-high insulated winter boots. Together we headed due south from our property; we slogged until we hit a spur of the VAST Trail, a network of paths maintained by the statewide snowmobilers’ club; and we then angled east over a hilltop until we hit the main path. From there the trail wound its way down to the farms that border Hyland Hill Road and Carrier Road below it. We had the woods to ourselves. 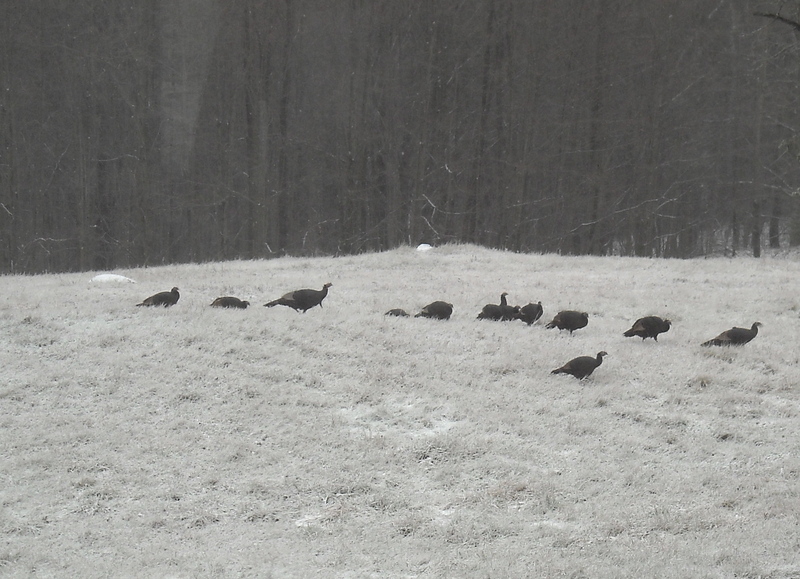 We saw many animals’ tracks in the snow—evidence of wild turkeys, deer, hare, coyotes or dogs, and moose—but rarely any sign of the animals themselves. H. W. Longfellow [in Evangeline, Canto I ] wrote: “This is the forest primeval.” But Henry got it wrong: this is not in any sense the forest primeval. New England’s wooded landscape may seem ancient, but it’s a johnny-come-lately. European settlers in the 17th and 18th centuries clear-cut huge areas of the Northeast to create their farms; then, during the 19th century, as the frontier moved west and emigration eased population pressures in Vermont, New Hampshire, and Massachusetts, a process of natural reforestation began. This trend continued during the 20th century and into the 21st. 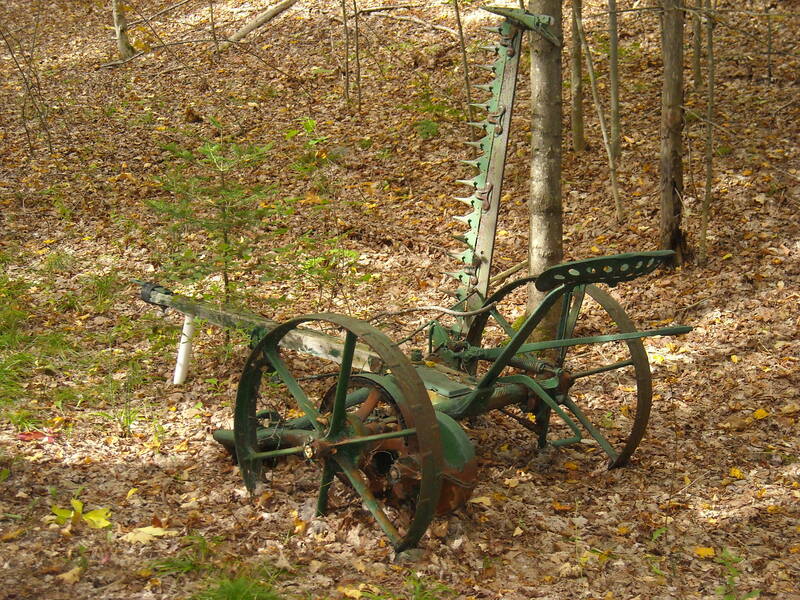 Deep in our own woods, we have found agricultural machinery—cultivators, threshers, and a bizarre spiked rack that resembles an Iron Maiden—all abandoned many decades ago in what was once open farmland. 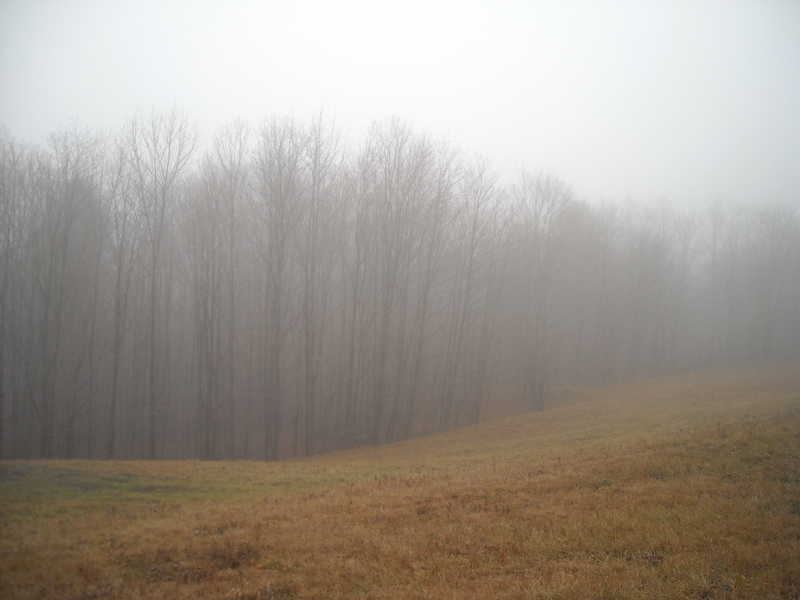 Vermont is now 75.2% forested and is the fourth-most wooded state in the nation. Our little corner is typical of the area. But because the process of reforestation is relatively recent, most of the trees on our property are small: mountain maples thinner than the lodge pole pines of my Colorado youth. Old-growth maples, oaks, and other big trees are almost nonexistent. Even so, the forest can feel ominous. A neighbor to the east warned us outright in a message: “Please be aware that a black bear has her den on our land, and there are numerous transient predators, including red fox, wolves, and coyotes. Exercise a degree of caution, and if you see them, give them their space, and you will be fine.” All very reassuring. Even so, getting acquainted with any of these animals is an event we choose to defer. We see their footprints. We hear the coyotes’ howls and yips at night. We keep our distance.